magic number is an achievable and real number, or is it just pulled out of a food and beverage book or industry average? Who knows, maybe they heard Anthony Bourdain say what it should run on Food Network or on the Travel Channel. Bottom line is you need to know how it being computed? Most restaurants and bars do have their top people on some kind of performance based incentive program, but unfortunately for them, the establishments are still computing the cost percentages based on some kind of magic number that they have either learned at culinary school, or fits their income sheet expectations. Beverage costs, just as food costs, can be tricky but finding a true beverage cost is essential. Cost percentages are computed by dividing the cost paid for a product by the selling price of that product. Using wine as an example, for a whole month or given period wine cost (or beverage cost) is the total amount spent on wine divided by the total revenue from wine (wine sales). That is the correct way to do it, but is it telling you the whole story? If you are using the actual wine cost (or beverage cost)and comparing in to a stated goal percentage lets say 35% then it is not! It may fit the owners spreadsheet nicely, but quite frankly a higher percentage could even be better. 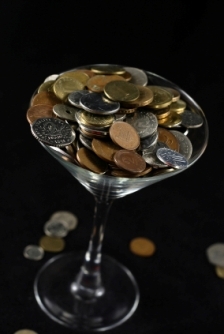 To find out you need to move away from actual wine costs and move toward ideal wine costs. What? Yes, Ideal wine costs, and they are quite different from the real costs that most establishments try to peg you to. The ideal wine costs breaks your sales down to a per item basis before coming up with your cost percentages. If there is something out of line then there may be a problem, but until you examine the ideal wine costs you will never know. Well, if you were held to that magical 35% wine cost you would want to sell wine bottle 1 all day long wouldnt you? But are you right? Well, yes, you would be, but your owner would be missing the boat! They would probably tell you that they wanted to run a 35% cost and that it would make since to sell wine bottle 1 too, but right then would be the time to show him just how smart you are (thanks to foodandbeverageunderground.com that is). If you were to sell wine bottle 1 you would certainly make your 35% goal, and the establishment would make a profit of $19.50 ($30-$10.50). If you were to have sold wine bottle 2 however, you would have blown your bonus and would have hit a 40% wine cost, but the establishment would have made $24.00 ($40-$16). The establishment would have made $4.50 more, some 23% if you would have sold wine bottle 2, but the cost would have killed you. Well, last time I took a deposit to the bank and added in a percentage point, they laughed at me. For some stupid reason they said they only took dollars. The moral of the story here is that you should always run an ideal cost and then compare it to the actual costs. To do this you should set up a spreadsheet and put the items you sell down the first column, the number you sold of each item from your product mix over the same period and the cost per item. Well, maybe there is an easier way to save you some time. Go to the resources page and you will be able to download our ideal cost spreadsheet. Weve done the work for you! Although we have used wine in this example the same situation exists for food, liquor, and beer too. It can also be compiled to do the entire beverage cost. You may be fighting a never ending battle with your owner if they are holding you to unrealistic numbers so going this will make those real numbers real, and these ideal numbers your savior!